Alice Schmidt started running much the same way as other runners - her older sister, Suzanne, was a runner on the track team and Alice wanted to be like her. Lucky for Alice that Suzanne ran track otherwise the U.S. wouldn’t have had one of the most consistent and reliable 800 meter runners the country has ever had. She’s made two Olympic teams and four World Championship teams. Alice’s specialty has always been the 800 meter run. She ran for Elkhorn High School in Elkhorn, Nebraska where she won the Nebraska State Championship in her specialty an unprecedented four times in a row. She progressed in the 800 at Elkhorn running 2:15 her freshman year and got down to 2:08.84 by the end of her senior year. With those kind of credentials it isn’t surprising many colleges were sending letters and calling. Her final three schools came down to Duke, Penn State and North Carolina. 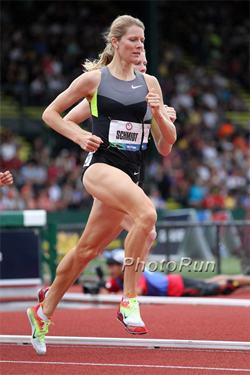 Just days before the early signing date she received a call from Shalane Flanagan saying, “Let’s do this. Let’s put North Carolina back on the map.” “I had already decided on North Carolina, but getting that call really made me feel I made the right decision,” says Alice. And make the right decision she did. With her teammates and eventual fellow Olympians Shalane and Erin Donohue they set multiple school records and won many championships. Besides being part of the winning DMR at the 2003 NCAA Championships Alice was part of the quartets that rocked The Penn Relays in 2003. That year at Penn, North Carolina won the 4x800, 4x1500 and DMR. In 2002 and 2003 Alice won two individual NCAA titles in the 800 for the Tar Heels. Alice graduated from North Carolina in December 2004 with a degree in journalism and political science. Her professional track career speaks for itself. In every race she is always a concern to her competitors. She has qualified and competed in four World Championships and qualified for the 2008 and 2012 Olympic Games. She placed 4th in the semi-finals at the 2012 Olympic Games. Two of her most memorable races came in 2012. Those were the 1500 at the Prefontaine Classic and the other was the finals of the Olympic Trials. At Pre she held off 2010 Aim High Special Guest and 2011 World Champion Jenny Simpson in the final straight and won in a personal best 4:05.64. In the 800 final of the Olympic Trials Alice had to make a last ditch effort surge to pass competitors in the last few meters to make her second Olympic team. Alice currently resides in Charlottesville, Virginia where she is in the pre-medical program at the University of Virginia. Her husband, James Kehaya, is in the U.S. Air Force and is currently stationed in Florida.